Massa completed a very lengthy stint at Ferrari, riding the ups and downs of a rollercoaster career at the Scuderia. Through supporting his teammate’s championship battles, to his own 2008 title near-miss, and of course the horrific accident in 2009, his attachments to Ferrari and Italy were clear. For 2014, those bonds were broken and Massa made the move to Williams for a new challenge in his F1 career. He announced his retirement from the sport at the end of 2016 but was tempted back for 2017. Felipe Massa put in some very strong karting performances in Brazil before he moved to Europe to step up to single seater categories. He raced in both the Italian and European Formula Renault series, winning the championships in both in 2000. He followed that up with a title in the Euro Formula 3000 series, which then got him the attention of the Sauber F1 team. After a test with the Swiss team, he was signed for the 2002 Formula One season. Initially, Massa’s performance showed great potential and pace, but he gained a reputation for spinning and retiring a lot. After his first year in the sport, which included a one race ban late in the season, Sauber didn’t sign him for a second, so Massa moved to Ferrari – engine suppliers to the Swiss team – for a year as a test driver. Having honed his skills a little more, Sauber re-signed him for 2004 and 2005. He continued to improve over the course of the two seasons, and ahead of the 2006 season, he made the move back to Ferrari, this time as a full time race driver. Partnered with Michael Schumacher, Massa put in some very strong performances for the Scuderia but he was always going to be overshadowed by the German champion. With race engineer Rob Smedley on the pit wall, Massa continued to improve his driving skills and the pair of them made a famous and surprisingly popular couple in the paddock. Massa remained at Ferrari when Schumacher retired, and supported his new teammate Kimi Räikkönen as the Finn secured the 2007 World Championship. 2008 was finally Massa’s turn to shine. The season didn’t get off to a good start but things gradually improved until Massa was fighting for the title. In the final race of the year at Brazil, he and contender Lewis Hamilton fought to the very line for the championship victory. Massa took the chequered flag, winning the race, and for a brief moment, he thought he had done enough to win the title. However, Hamilton managed to claw back just one more position in the final corners and thus the championship went his way instead. Massa took to the podium, tearful but proud, in front of his home crowd. In the midst of the 2009 season, the momentum gathered the previous year was brought to an abrupt halt. During qualifying for the Hungarian Grand Prix, Massa was struck in the helmet by a spring that had worked loose from the car in front. He was rendered unconscious, crashing into the barriers off track. He was airlifted to hospital and operated on, with surgery around the left eye, and to support the skull structure. 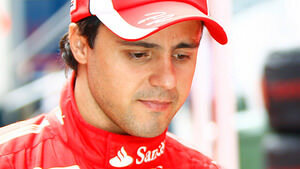 Although the situation was critical, Massa’s condition improved very quickly. He returned home to Brazil and took no further part in the F1 season, instead recovering and rehabilitating. Back behind the wheel, after a brief stint testing an older car, Massa returned to action for the 2010 season. Now partnered with Fernando Alonso, Felipe unfortunately found himself relegated to that number two driver slot, supporting Alonso as the Spaniard hunted for a title. Despite driving hard and picking up strong results, he couldn’t match his teammate’s pace and his future with Ferrari was constantly under speculation. The team repaid his loyalty with some of their own, retaining him until 2013, but he was finally released from the Scuderia at the end of the year. For the 2014 season, Massa took on a new challenge, joining the Williams team as they attempted to turn things around after a dismal couple of seasons. He arrived at exactly the right time, as the team did experience an upswing in performance. Massa was the only driver outside of the Mercedes team to scoop a pole position, and he came close to winning his home race in Brazil. Consistently vocal about safety and outspoken about ways to improve the sport, Massa remains a popular figure in the paddock. He continued with Williams for the 2015 season, partnering Valtteri Bottas for the second consecutive year, and impressed enough to retain his seat for 2016 as well. Midway through the 2016 season, Felipe Massa announced his intention to retire from the sport at the end of the year. At the penultimate round of the year, his home race of Brazil, Felipe crashed out of the wet race and had to make his way back through the paddock on foot. A standing ovation from nearby teams and mechanics was an emotional experience for the Brazilian racer. He wrapped up his final race in Abu Dhabi, bidding a brief farewell to Formula One. When Valtteri Bottas was confirmed as Mercedes' choice for the 2017 season, Williams in turn announced that Massa was coming out of retirement to fill the gap. The team wanted to team his experience with the rookie driver Lance Stroll, and had been talking to Massa for several weeks or months to convince him to return. He said he was excited to be back, after what could be considered the shortest retirement ever, and that he wouldn't have returned for any team but Williams. Learn more about Felipe Massa with the Pocket F1 Handbook. Felipe Massa has also taken the early switch-to-yellows strategy, and he's running ahead of Vettel now. Felipe Massa, running in sixth place, also hasn't stopped yet, running a longer first stint.